Before rocking Ozzfest’s main stage, before motivating every Sonic Youth-loving snob to give in and make the devil horns with metal-loving gusto, the Queens of the Stone Age existed as just a deranged idea in the mind of future band leader Josh Homme. Since his master plan kicked into action, guitarist/vocalist Homme and the California-based, heavy-rock group released four albums that challenged conceptions of what a metal band could sound like, what type of songs they should play and even the notion that they had to have permanent members in the group. With each new record — and as musicians slid in and out of the band’s lineup — Homme’s instincts proved increasingly prophetic instead of heretical. While a stadium tour still remains tantalizingly just out of reach, the Queens have grown into one of metal’s most critically praised and creatively exciting acts. That Homme has kept the group on track for so long likely owes equally as much to his stubborn desire to prove wrong all the doubters and ex-bandmates as his enduring vision for the group. This would explain what Homme and the band were thinking when they made their fifth album, “Era Vulgaris.” The disc marks a transition to a new period for the band, but one in which Homme’s vision for Queens has become increasingly blurry. As was the case with their last LP, 2005’s “Lullabies To Paralyze,” the Queens continue to suffer from the loss of ex-Screaming Trees singer Mark Lanegan and livewire bassist/vocalist Nick Oliveri. The pair often shared the microphone with Homme, and the two albums that the trio played together remain the band’s unrivaled high water mark. The last record did little to compensate for this absence or for the lack of other musical personalities besides Homme’s, but on “Era Vulgaris,” he makes a wholehearted attempt to vary his vocal approach from track to track. (Lanegan does reappear briefly to provide some gravely backing vocals to “River In The Road.”) His effort is appreciated, but we’re still seeing a weakened, less dynamic version of the band. A far more pressing concern, however, is this record’s overall ragged and sometimes obnoxious sound. It also has a disjointed stance on melody-making. Homme’s songwriting style has often been contradictory — tightly focused on structure and yet free-spirited and eclectic in terms of sounds. This quality is one of the attributes that propelled the Queens’ success. But on “Era,” some of the songs come across more distractingly fragmented than delightedly madcap. The new album is less polished than its predecessors, and Homme seems willing to simply string together a couple of riffs regardless of whether or not they’ll jibe with an attractive melody. There are several high-energy cuts and brief moments that recall the heights of the Queens’ early years, but one can increasingly sense a bewilderment or maybe laziness sneaking into Homme’s new music. This saddles the disc with a level of inconsistency and an unnecessary sonic brutality. Perhaps Homme sought to keep these forces in check by reuniting with Masters of Reality mainstay Chris Goss as he shepherded the disc along. Goss produced arguably the Queens’ best album, “Rated R,” and his return can immediately be heard in the honeyed, falsetto harmonies that sweetened past classics like “Monsters In The Parasol” and “Better Living Through Chemistry” and now return on new cuts like “Turning The Screw” and “Suture Up Your Future.” But even powerful old partnerships can’t right what’s wrong with some of these tracks. The frenetic “Sick, Sick, Sick” is a hot-rod rocker that seems better suited for the next Eagles of Death Metal record. One can imagine girls in cages flanking the stage as the band lays down this snaking boogie groove. The Strokes frontman Julian Casablancas appears at the song’s conclusion to add some woozy backing vocals. It’s a fun listen once or twice, but not a cut with staying power. The same holds true for “3’s & 7’s,” which is an ever-shifting amalgam of guitar thunder that never realizes its full potential. There are several thrilling passages, but the sudden transitions between them could lead the listeners to believe that the musicians suffer from severe ADHD. “Battery Acid” is similarly confusing. It has a noisy, post-punk rhythm with a stretched-out tempo, then a wimpy chorus and squealing King Crimson guitar solo. No other song on “Era” better represents this album’s uneven nature than “I’m A Designer.” The track is dominated by garage band noodling that, just when you reach to click to the next track, is interrupted by a chorus of startling evocative power. The song’s skeleton is a jarring three-note guitar motif and Joey Castillo’s hip-hop drums that, in total, aren’t really that interesting apart from Homme’s charming and crass swagger performance behind the mic. His cockiness isn’t enough to qualify this track for repeat listens until a dream-like, “Rated R”-era chorus hijacks the sleaze-fest into the hard-rock heavens for a few bars. Just as quickly, we’re dumped back into the garage. Other tracks on “Era” are more successful. “Turning The Screw” combines another hip-hop drum pattern with clanging, somersaulting guitar licks. Homme and Goss chime in with lush vocal harmonies that ridiculously quote lines from “The Silence Of The Lambs” and other movies, are meant to be sage advice wrapped in a pop-culture wrapper. “You ain’t a has-been if you never was,” they pair sing before a monster solo mutates into the guitar-led rhythm that oscillates, bouncing from one speaker to the other in mechanic precision. The song flows in a way that seems carefully pre-planned and not just spun together during a jam session. So do low-intensity cuts like “Suture Up Your Future” and “Into The Hollow,” which are majestic combinations of Homme’s falsetto vocals and moodier-sounding guitars. Old-school metalheads might skip ahead in search of Motorhead redos, but these tracks are documented proof that Homme’s skills haven’t eroded, only his ability to maintain consistent quality control. Homme certainly has a right to feel vindicated. The Queens have overcome challenges and established that his vision of metal could appease genre loyalists as well as win new converts. But now that Homme has accomplished his mission and gathered a tribe of followers, he needs something else to say. For any artist, discovering a new purpose is paramount. “Era Vulgaris” doesn’t have a clear mandate and proves that he needs more deranged ideas to dream up. 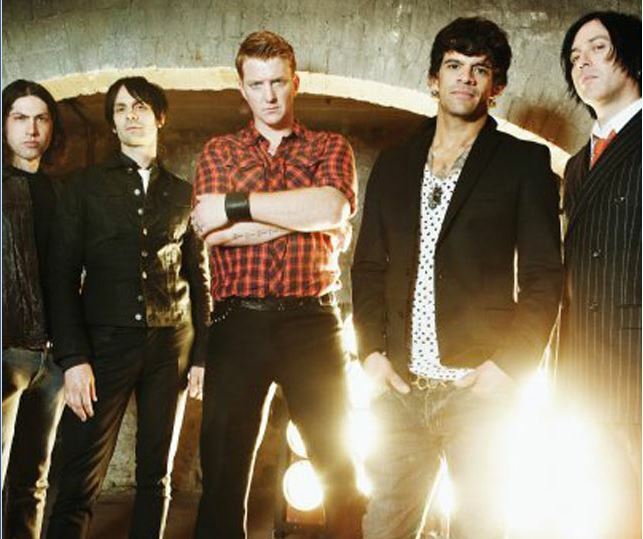 Tags: "Era Vulgaris", Chris Goss, Joey Castillo, Josh Homme, Julian Casablancas, Queens of the Stone Age, review. Bookmark the permalink.